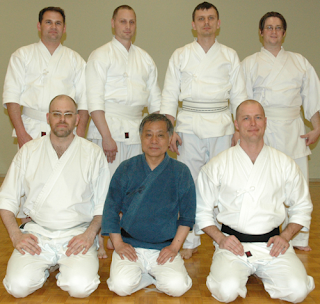 This past May I was thrilled to be able to attend Sugino Sensei’s seminar in Sherbrooke, along with a large number of other Katori Shinto Ryu practitioners from both Ontario and Quebec. For three days we practiced under Sugino Sensei’s keen eye. The experience brought back to me thoughts I’d had years ago, about how precious the gift of attention can be. And while of course receiving such a gift is something to be treasured, in recent days I’ve been thinking of how simple it can be for any of us to GIVE such a gift as well. I don’t mean that we must put on a fierce face and pretend to be locked in mortal combat, or try to intimidate or startle them. 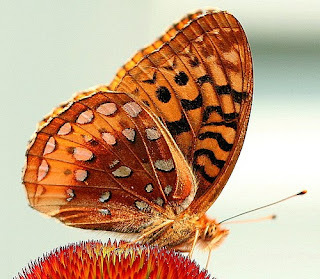 But we can give our attention to them completely, letting nothing distract us from their action. Not only with our eyes, but with our entire being as we perform the kata alertly, attentively, and with a fully present spirit. It is so rare in our lives that anyone truly pays attention to us. Most people spend every moment consumed with self-reflection, condemning themselves or praising themselves — usually without nearly as much cause as they imagine — that they have little energy left over to consider others. Our own lives and worries are so important to us that we ignore the people all around us. This behaviour keeps us from learning, but just as important, it makes it hard for those around us to learn as well. When they do not receive our attention, they do not receive useful feedback that they can use in their efforts to learn and transform. The practice of Katori offers us an opportunity to put our self-centered concerns aside and engage with others openly, presently. When we perform the katas, if we remain trapped in a selfish inward struggle, we fail to give our partner what they most need at this moment: our attention. This is one of the qualities that makes a teacher like Sugino Sensei so effective — he sheds himself and focuses entirely on what the student is doing. It is a lesson to myself that regardless of how poor my technique may be, or how tired I am, I can still be of tremendous value to my partner simply by paying careful attention to them. We are thrilled that our classes have been popular enough to warrant such a step. 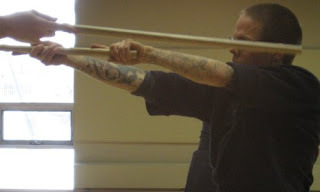 This group started in 2008 with very modest objectives — only to provide a space for interested folks to practice Katori Shinto Ryu in the center of Toronto. 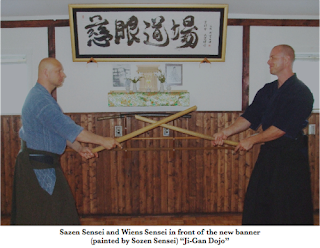 With the support of senior instructors like Tong Sensei and Wiens Sensei of Tokumeikan, Toronto Kenjutsu has been able to grow and flourish, providing a chance for students of Japanese swordsmanship to practice this legendary art here in Toronto. 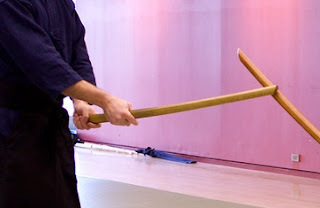 Katori Shinto Ryu is best practiced in small groups — only through direct communication can this subtle and demanding style be properly learned and understood. Each practitioner must have time to listen and absorb what they are learning. Opening a second evening of practice allows us to maintain our small class size and still accommodate more students. Toronto Kenjutsu was pleased to take part in this spring’s Haru Matsuri festival at the Japanese Canadian Cultural Centre on March 6, 2010. We performed there under the supervision of the senior Canadian instructors of Katori Shinto Ryu, including Wiens Sensei of Tokumeikan, who is Sugino Sensei’s senior student in Canada. Also present was Tong Sensei who teaches at Dragon Fencing Academy in Richmond Hill. Katori Shinto groups from around Toronto came together to practice and to demonstrate traditional Japanese swordsmanship to the many folks attending Haru Matsuri. These events are always a great chance to practice with folks we don’t usually practice with, and to learn new techniques and share our observations on this ancient art. Working with new people means paying very close attention to each detail. When you always practice with the same folks, you get used to each other’s styles and can unconsciously start to anticipate each other’s moves. If I start anticipating my partner’s moves, then I’m not using my senses to understand what I’m seeing and respond — I’m interfering in that process with my expectations and my ego. One of the gifts of practicing with new people is that I am stripped of my expectations and am forced to observe, and react solely to what is there, rather than what I expect. Of course I hope I can act this way even with people I am familiar with, but it’s useful to have these chances to put that to the test. We are now safely ensconced in our new location at Kokoro Dojo. The very fine folks of Sandokai Aikido and our little group have moved into our beautiful new home near Dupont Station as of June 15th. Kokoro Dojo has a lovely place set back from Dupont Street amongst trees and old houses. It’s very lovely. Enjoy thesummer and if you have any questions about Toronto Kenjutsu’s practice, feel free to drop by! One of the things I can remember learning first from Sugino Sensei was how to bow properly at the start of a session of Katori Shinto Ryu practice. It’s a very distinctive ritual: from seiza, one bows twice, then claps one’s hands twice, then bows once. I am not the sort of person who asks for explanations, so I never asked why we bow in such a fashion. I have heard that it is a Shinto practice whereby the clapping is symbolic of awakening the god, but I don’t know that this is the truth. What I do know is what I have come to experience after years of performing this tiny little act day in and day out: connected. Becoming a community of mutual purpose is what the opening bow is all about. We line up together, and we demonstrate our willingness to humble ourselves. Doing it twice makes sure that it wasn’t a mistake. That it wasn’t done casually, or without thought for the meaning of the act. When we clap, we are acting in concert, with immediate feedback as to how united we are. There should be only a single sound each time as every pair of hands comes together simultaneously. At least, when I hear that, I feel a lightness inside myself and I can’t help but smile at the feeling of connectedness that fills me at that moment. It’s a lovely reminder of how we should practice Katori throughout the session — connected to each other, fully engaged and responsive to our partner, our instructors and our fellow students. We need to pay attention to the full reality that emerges before us, and we need to allow our responses to that reality to emerge naturally and completely, without hesitation or preconception.